Facial oils only really started appealing to me four years ago when I moved to the UK. Before that, I lived on the sunny east coast of Australia that has an average temperature of 30 degrees for most of the year so the idea of putting oil anywhere near my face didn't really entice me. Now however, not only am I older (29 in 3 days!) but my skin is subjected to cold winters and rather drying weather all round so facial oils are now a pretty important part of my skin routine. I love the indulgent aspect of using facial oils and feel like there's something a bit special about pressing beautiful oils into a freshly cleansed and exfoliated face. 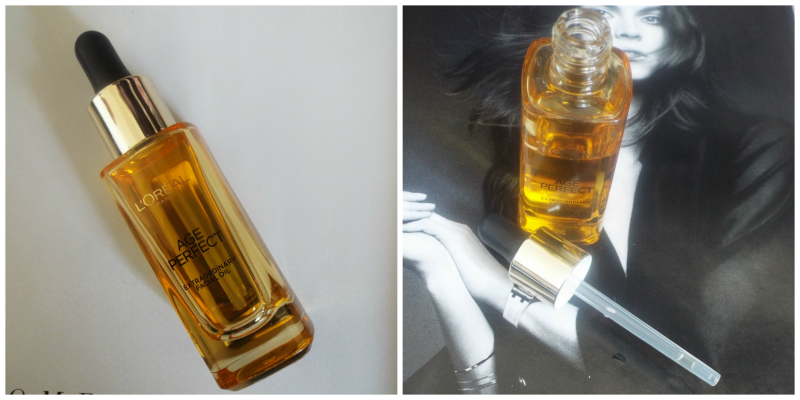 My latest facial oil purchase happened a few months ago now in the form of L'Oreal Age Perfect Extraordinary Facial Oil and after using this 3 or 4 nights a week since June I think I'm ready to share a fair review. Firstly, this facial oil smells gorgeous. It's packed with essential oils - lavender, orange, geranium, rose, lavandin, chamomile, marjoram and romarin and therefore has a lovely, comforting scent that's perfect for use in the evening. The Extraordinary Facial Oil is supposed to 'replenish, smooth and brighten' and I have to say that I've found it effective in contributing to all 3. Though I mainly use this after I've washed my face before bed, I will occasionally pat a drop of the oil into my skin before foundation application as I find it gives quite a smooth base. After using this at night, I wake up to smooth, soft, glowing skin with no oil slick in sight and I can genuinely feel the difference. What's not to like about that? Due to the fact that this is a 'dry oil', the formula absorbs quickly to a non-greasy finish and you only need 2 or 3 drops per application.